Yes, it's still warm enough in Texas for tea outdoors! 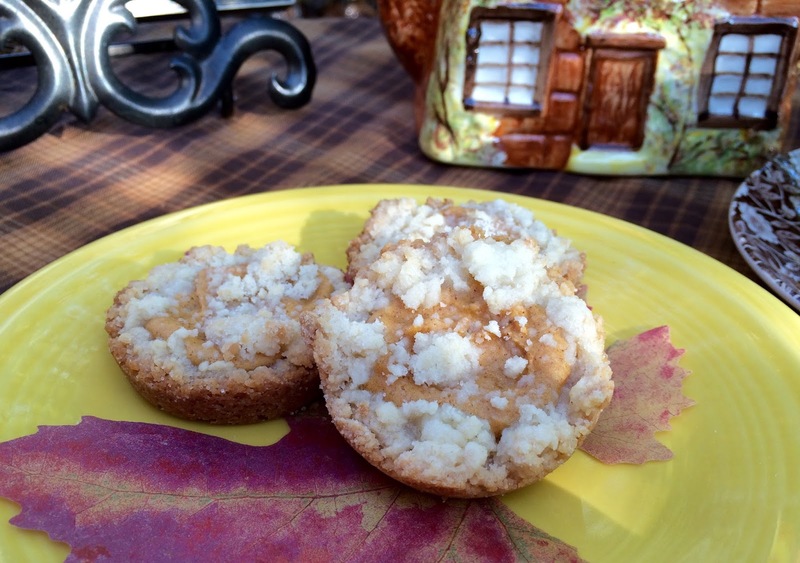 I've created a Fall tea for us to enjoy, with some Pumpkin Pie Cookies and pumpkin chai tea. This Calico teacup by Crownford China, Staffordshire, England, is a favorite of mine to use in the Fall. It looks pretty with my cottage teapot, don't you think? Heat oven to 350 degrees. Generously spray bottoms and sides of 24 regular-size muffin cups with cooking spray. Place cookie mix in large bowl. Cut in butter and 4 oz cream cheese, using pastry blender or fork, until mixture is crumbly. (Do not overmix.) Reserve 1 cup cookie mixture for topping; set aside. Firmly press 2 tablespoons remaining cookie mixture evenly into bottom of each muffin cup. In small bowl, add 3 oz cream cheese (I used 4 oz) and stir until smooth. Add remaining pumpkin filling ingredients; mix well. Place 1 rounded teaspoon pumpkin filling in center of each cookie. Sprinkle each with 2 teaspoons reserved cookie topping. Bake 18 to 20 minutes or until edges of cookies are golden brown. Cool completely in pan, about 30 minutes. Run metal spatula around edge of cookies in muffin tin to loosen. Note: I had enough leftover to put into the bottom of three custard cups. This is my "Autumn" Lizzie Kate design that I finished. I just interchange the seasonal designs into the same frame. Can you see the tiny buttons that are sewn in? Oh my sweet tooth !! These looks and sounds so good, just may have to try them! Kitty, your cookies sound simply wonderful. I LOVE pumpkin pie so I would surely like these. Thanks for the recipe. I love your teacup too. It's a darling pattern with your cottage teapot. How lovely to have tea outdoors! You saw what my deck looks like, right? No more outdoor teas for me this year. Thanks for joining me for my indoor tea and enjoy your warm weather, my friend. Hi Kitty. I almost used my Cottageware today. I love your Crownford...the pattern is called Calico. I love it! And I love your little cross stitch! I have a winter design I just have gotten out to do...you've inspired me to get started! Thanks so much for linking to Tuesday Cuppa Tea! 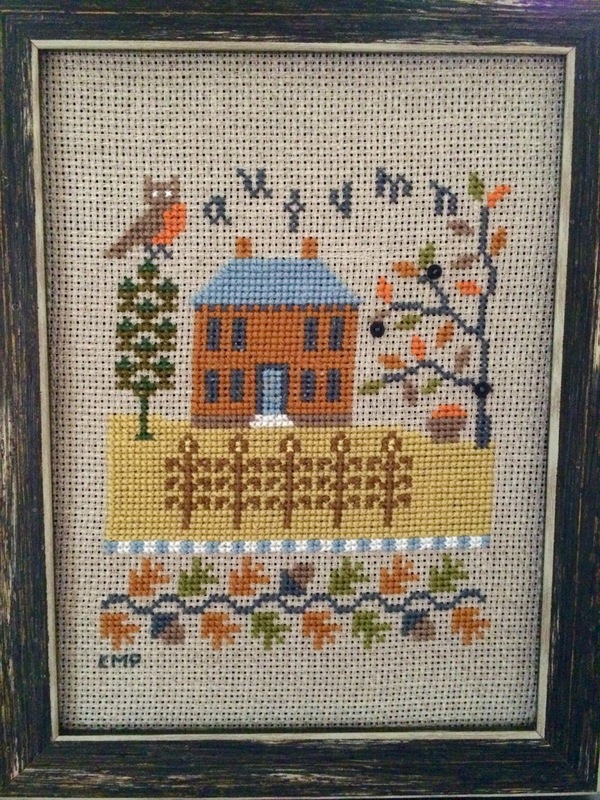 Kitty, I love, love, love your Staffordshire; you're right, perfect for Fall, and absolutely so charming with your cottage! Beautiful cross-stitch, such intricate detail! Have a beautiful day! Completely charming autumn tea and those cookies look wonderful...wish I had the ingredients in the house! The tea cup is darling and certainly perfect for this time of year. The calico teacup is a pretty autumnal pattern and does match your teapot nicely. The little pumpkin sweets would be perfect as a replacement for pie at Thanksgiving. I sure wish I was coming to tea in your backyard today! It's so chilly here. I love the tea cup! I have dessert plates in that same pattern, but they are cobalt blue. Hi Kitty, Oh what a beautiful setting for tea. I love your gorgeous calico teacup and cottage teapot. What a beauty each is!! The recipe looks so yummy and thank you for sharing the recipe. I will save this one for sure. I adore your stitch work Kitty. The tiny buttons are adorable. What a great idea to change out the design for the season using the same frame. In fact I love the frame with it's bit of distress. Just charming. You are so very talented and an inspiration for me to finish my ufo's of embroidery that need to be completed. Hope you had a great weekend. We had a wedding and it was beautiful. Can you believe I have the same teapot and the same cup and saucer. Isn't that funny. What a great recipe it I just baked something similar too. We are on the same page today for sure! So glad you shared. Oh my, these sound delicious! Don't you love little individual desserts? I do have the ingredients and will certainly try the recipe. Thanks so much for sharing! You have so many beautiful tea cups and saucers plus darling tea pots! The calico pattern in brown is just perfect for this time of year. I'm thoroughly enjoying this weather...finally. :) A dear friend of mine lives in Syracuse and they have snow! IMHO, it's a bit early for that. Your needlework is beautiful. I used to do a lot of cross stitch and needlepoint. I really enjoyed it and was kinda like "therapy" for me. Just can't do it anymore...eyes won't allow it. I saw Celestina's beautiful kitchen towel you made! You are definitely a lady with many talents. I want an embroidery machine so bad! 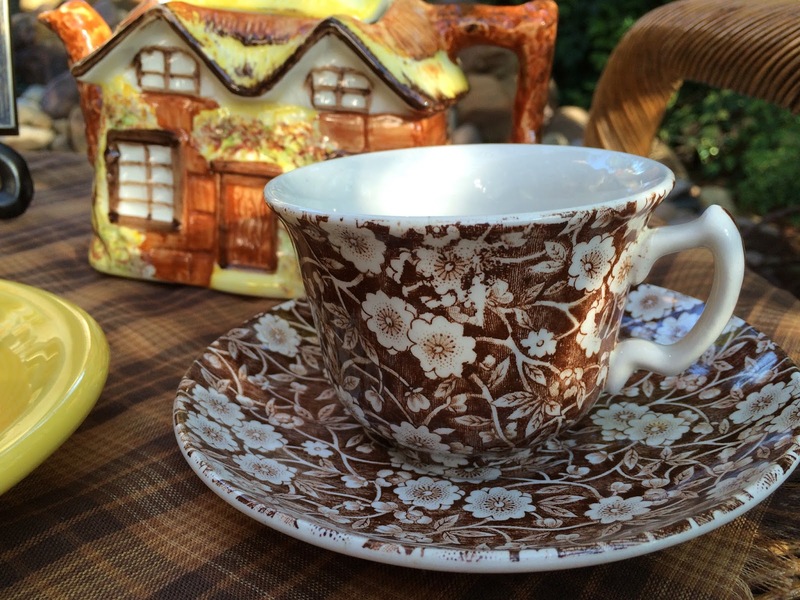 Your brown chintz teacup and cottage teapot look lovely together. I'd love to have one of your yummy pumpkin pie cookies. Your cottage teapot is so cute! I see similar vintage teapots online and I'm always tempted to buy one. They remind me of fairy tales and make the perfect tea party teapot. My husband is not a fan of pumpkin pie so I should try these cookies around Thanksgiving (or better yet now). I really admire your cross stitch. It's nice that it is on display so you can enjoy it too. Wow you did it again! You have made amazing looking pumpkin cookies. Thanks for sharing this recipe with us at Cooking and Crafting with J & J. We can't wait to see what you share next time. These look really good and I LOVE the cup and saucer. Happy Fall! Your treats are always so delicious and tempting. The cup and saucer are beautifully suited to fall. Have a wonderful day, Kitty! Your cross stitch project finished up well! Oh wow...what a neat recipe! They sound simply amazing! Kitty, I love your teacup! It really brings out the brown roofline on your cottage teapot. The cookies sound yummy and I love your stitching! I want to try one of hers. Glad you will be sharing this with SYC. What a lovely fall tea. Pumpkin recipes are synonymous with fall, and your pumpkin cookies look delicious. Love your teapot and teacup, as well as your counted cross stitch piece. Yes, I see the tiny black buttons in the tree. Have a great week, Kitty! Oh yum! What a delicious fall treat! I could definitely go for a few on a nice cool Saturday afternoon! A perfect fall tea. The goodies look tasty. How about all this rain we are getting, we have had 10 to 12 inches at this point. 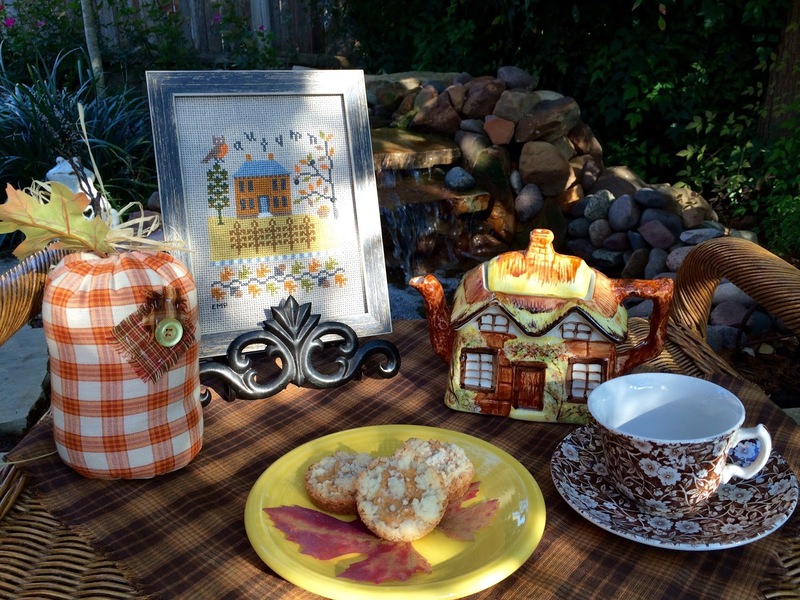 Your fall tea setting looks so pretty and a perfect setting for your awesome Pumpkin Pie Cookies! Hope you are staying dry!! Thanks so much for sharing with Full Plate Thursday and have a great weekend! I can smell the aroma of the cookies baking. Love that teacup. Those cookies look so yummy and delicious...pinned! Thank you for sharing the recipe and your tips. I love the calico teacup. You're right it's so perfect to drink from during this time of year! Our mornings here in AZ are so pretty and cool which is perfect for my daily 2 cups of java...no more breaking into a sweat; but I'm waiting for cooler afternoons for my hot tea. 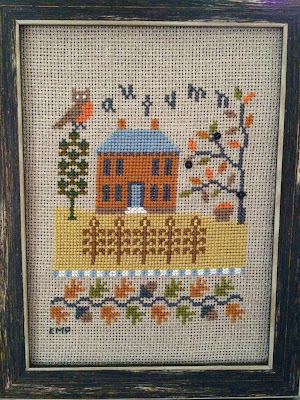 Your Autumn cross-stitch design is so cute...yes I was able to see the teeny tiny buttons! Did you make the cloth pumpkins? Kitty, so lovely! And I do enjoy the taste and the look of pumpkin desserts. Pumpkin goes so beautifully with a nice cup of tea. What a lovely autumn themed tea setting! I love the chinzy tea cup with the cottage tea pot. The plaids and your beautiful cross stitch really give it a cozy feeling.